When we went to see Ray Bradbury were staying at the Omni California Plaza hotel in Los Angeles. Because they are great they have a select guest program. One of the many perks is complementary beverages for two each morning. One hot and one cold. For me the choice was simple. I do not drink coffee and I carry my own tea bags everywhere. I also love good hot chocolate. Nice hotels usually serve up a decent cup of cocoa. My order was for hot chocolate and orange juice. When I took the first taste of the hot chocolate I was surprised. It was spicy! It was "Hey, I feel that all the way down my throat" spicy. I told my husband he had to taste it and he loved it, too. Each morning (and some evenings)I ordered this strange hot chocolate and wished I knew how to make it myself because I was going to miss it when I was gone. When I came home I wrote a little blurb on my blog about the Omni California Plaza and how much we enjoyed it. I mentioned the hot chocolate. 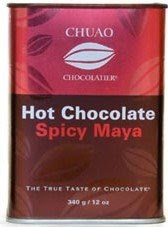 Then I did a little research and found it it was Chuao Chocolatier's Spicy Maya Hot Chocolate. No wonder it was spicy! I thought I tasted cinnamon and pepper! Let me tell you about Chuao. Chuao is a small village located in northern Venezuela famous for its cacao plantations. Some of the finest cocoa beans in the world are produced in Chuao. The village is surrounded by mountains and dense rainforests to the south and by the Caribbean Sea to the north. Visitors must come by boat from along the coast, or by foot, crossing the mountains and the luxurious cloud forest from Turmero near Maracay. Did I mention that I used to live in Maracay, very near Chuao? It's a beautiful place. In the Chuao plantation there are pure Criollo and hybrid varieties of cacao grown. Criollo beans from Chuao are of very high quality, and are considered Venezuela's finest beans. 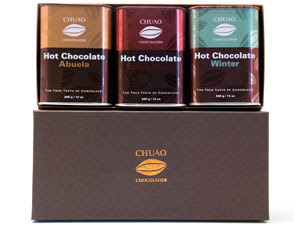 Besides Spicy Maya hot chocolate, Chuao Chocolatier also offers Abuela (meaning grandmother) and Winter varieties. Hot chocolate isn't even Chuao's claim to fame. They have chocolate bars and bon bons and choco-pods, among other items. The first time I saw Chuao chocolate I was in World Market. I brought some "Caracas" bars home for my husband. I thought they were a nice little novelty since my husband is from Venezuela. He was thrilled. I had no idea when I was at the hotel that I was having Venezuelan cocoa from Chuao. I still sit here shaking my head about all the wonderful things to come from Venezuela. First, go to Chuao Chocolatier and take a look at all their wonderful offerings. Then come and tell me which one you think would be your favorite. 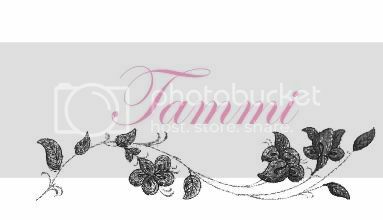 I will choose a winner on Monday, May 18th. U.S. entries only, please. I'd love to try the Abuela hot chocolate. I'm thinking it would be a new favorite of mine. I subscribed to the Chuao newsletter. I'm following A Funnel Full of Soup! Yummy! Thank you for the giveaway. The % origins bar set would be my first choice, since you get to taste 3. After that the field is wide open. Without a doubt my favorite would be the winter hot chocolate. I love winter and hot chocolate. Thanks for the great giveaway. This all looks so wonderful. I'd love it all, but I think my favorite would be the Chinita Nibs Bar Set. I've subscribed to the Chuao Newsletter. I've also subscribed to Full Funnel of Soup. I have no clue what it is but I'm going to live on the edge and say I want the ChocoPod Modena Box. I see Strawberry, Chocolate and Caramel that's all I need to know. I also love hot chocolate. I'd like to try their WINTER hot chocolate. The blend of spices for that one looks good to me. I love spicy. I love chocolate. Combining the two would be a taste of heaven!! I would choose the Abuela Hot Chocolate. I love good hot chocolate and it's so hard to drink the other. My mouth is watering! I would love to try the chinita nibs bar! I would love that box of 25 assorted bonbons. I love a good cup of cocoa, too, and I make my own frequently. I am working my way through a stack of recipes. It is not easy to make a good cup of hot chocolate and it is expensive ingredients. Oh I bet that would taste so good. I would love to try the "Spice Up Your Life" Chocolate Assortment. Oh wow, these sound WONDERFUL. Winter hot chocolate sounds divine. I would die and go to heaven if I had the "The Fiery Taste of Chuao Chocolatier" Chocolate Assortment. I would love to try the Firecracker Truffles. I've been a fan of the Abuela & Spicy Maya Hot Chocolates for a while now; they really are delicious! I am following on twitter as susieqtpie and I just tweeted!!! I follow Aunties Kitchen Antics!! I follow this blog too! I'm following you on Venezuela Scope! I follow FUNNEL FULL OF SOUP! I have the Funnel full of soup button on my blog! I have your cute Funnel full of soup button on my blog!!! The Firecracker Truffles sound good! Somebody's Mother Makes Amazing Sauces! I Am Woman, Hear Me Be Ignored?